National Trust of Australia (ACT) hosted a public Heritage Election Forum at St John’s church hall in Reid last Thursday. Five ACT election candidates were invited to present for 15 minutes each. This format was different to that used at the Northside Kurrajong forum that was a Q&A with no speeches/presentations. 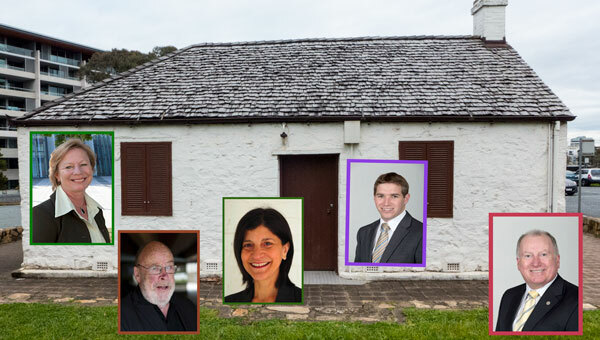 The invited candidates at this heritage forum were Marea Fatseas (Independent), Veronica Wensing (Greens), Alistair Coe (Liberal), Richard Farmer (Canberra Community Voters Party) and Mick Gentleman (Labor). So what happened on the night? The meeting nearly went off the rails with the first presenter, Mick Gentleman, who delivered the standard ‘the government is wonderful and planning is good’ speech. He stuck to this line with just about ever other response to any questions. I got really bored and wondered why was I sitting there on this cold night – the person sitting next to me said “I can’t do this” and then promptly left. Richard Farmer talked about an open process and about honesty in government. Alistair Coe did quite well, knew his way around most of the topics, and made some positive commitments. He lost me again on his push for a Chief Engineer. He has a future in politics (I think that’s a compliment). The real stars of the show were the two women. I would trust these two people with running my city. Veronica Wensing knows her stuff and offered some constructive proposals for the city’s planning and within that its heritage. She said that the Greens would adopt all the listed proposals as put forward by the National Trust. Marea Fatseas could not be matched on her key strength in that she so clearly demonstrates that she knows what so many in community are thinking and about their passionate aspirations for good government. Marea was on top of the heritage issues, the environmental issues and that community engagement is the only way to go. She got the most applause. The other big topics for everyone except Labor were the need for an integrity commissioner (or something similar), for more transparency, for a complete root and branch rework of the planning regimes, and for the Land Development Agency to be totally removed from planning (loud applause) – or for the LDA to be shut down completely. My summary takes the form of ratings out of five – to indicate how the candidates performed in this particular forum being focussed on heritage, planning and community engagement. There were many new commitments made by most of the candidates – sadly not much from Labor. The National Trust ACT will be loading to their website a detailed report of what was said by the candidates. Reminder: The early or pre-poll voting booths opens today – click here for details.